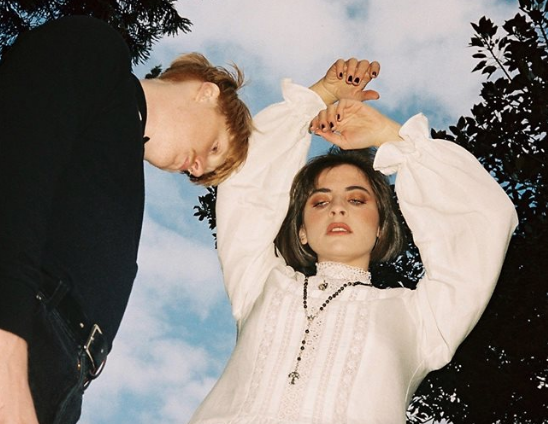 During BIGSOUND, I sat down with Bella and Lachie from the Melbourne rock outfit IV League — we had a talk about their visuals, musical inspirations and their single ‘Superstar’. Loving the name! What made you decide to pick it? Lachie: When we were trying to decide on a name, League just kept popping up. Bella: And I was reading a lot of Jack Kerouac, where he talks a lot about Ivy league schools. Then we thought, my initials are IV and Lachie’s are LG so we’d just drop the Y. But that’s actually caused us a lot of trouble, because people think it’s the roman numeral for 5. Lachie: Or even that it stands for IV drip. Having parts of real names in the band name can be personal, how much would you say your own personas exist within the project? Bella: Where we're trying to go with our aesthetic moving forward is definitely like a part of me and bits of Lachie too. It's definitely different from our everyday life. Lachie: It's almost an extension of us, but we're trying to be what we're influenced by. Bella: Yeah, we're trying to project our influences and our more artistic dreamy sides, but then, obviously in our latest press shoots, they're quite whimsical, gothic and dark, as opposed to our real lives where we are kinda just like skater dudes. Visuals and music are known to sit together in a sort of marriage, how important is it for IV League to harmoniously marry the two? Bella: It's become more important to us now and we've got a clearer vision of where we want to go. Lachie: It goes hand-in-hand with the music — if you're proud of the music, you become proud of the way you present yourself. Bella: Even in the way we've started dressing on-stage, and in our new images and music videos — it's allowing us to take on a persona. I would never normally wear a white wedding dress from an op-shop in my regular life, but when I'm on-stage, it kind of helps me embody a different part of my soul. Lachie: The way you present yourself is just really important. We try our best to be the whole package and to be as professional as possible. This year, you released the audio and visuals for 'Superstar' — how would you explain it to people that haven't checked it out yet, what can they expect? Bella: It's has a kind-of 90s teen movie kitschy vibe and it stars the four of us in the band working at a fast food diner and then deciding to quit our jobs and drive off into the sunset. I’ve checked out the video and I’m curious, how did you find that scene when you were dancing on the counter? Bella: Oh yeah, that definitely wasn't my idea. That was the director and she kind-of sprung it on me. It’s just not something you expect to do completely sober. I’m not going to lie, it looked slightly terrifying. I feel like anyone else would’ve slipped and fell. Bella: Yeah, especially in those chunky boots. I just love the way they cut it together with our friends sitting in the diner just laughing. I was about to mention that they excel at that look of being so annoyed by everything you’re doing. Bella: I personally would love that if I was in a Hungry Jacks and the staff just got up and danced! The video and track is such an experience — how do you plan to bring that to the live shows? Bella: We'd love to step-up the visuals. We've had friends when we're in Melbourne do projections a couple times, also we’d like to add to the sonic experience messing around with a lot more SPDs and reverb mics to really bring the aesthetic and the recording to the stage. Lachie: We’re just trying to constantly improve and introduce new things to make everything sound better. It’s all a natural progression. IV League is part of this sort-of new generation of punk/rock. What do you feel IV League brings to a genre that’s been around for so long? Bella: Where we envision our career going and what we're really interested in is becoming a band that could possibly go international one day. We really love a lot of bands from the UK and the US as well. Lachie: I think we have a more modern take on the genre with how we blend international influences with 90s guitar music. Speaking of international influences — which artists would you say are your current inspirations? Bella: Currently Shame, Goat Girl, Wolf Alice, mostly bands from London. So, what’s next for IV League? Bella: We have an EP coming out, TBA on the date, but the new single should be out soon! Lachie: Also, new music and more shows! Looking forward to it! Thank you for chatting with me today! You can catch IV League at Melbourne Music Week on Sunday, November 18th. Click here for more infomation.